My experience with Proflowers has been a wonderful one. In continuation of my journey with them, I bring you Shari's Berries. I couldn't help but order a basket again. 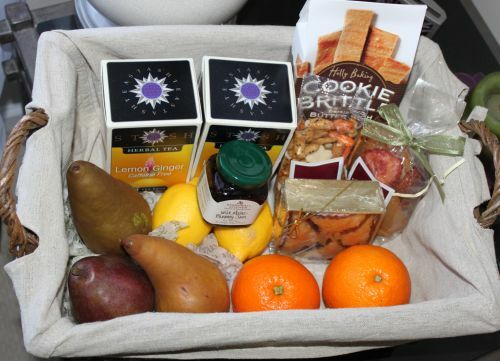 Last time it was a fruit basket and this time it's a Tea Time Basket. 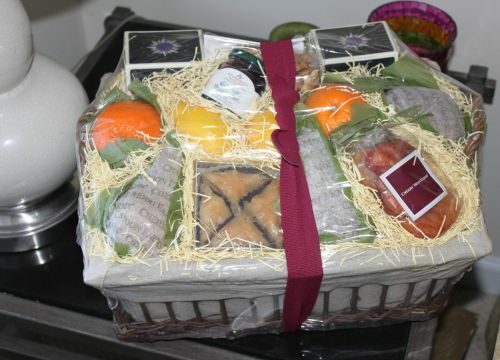 I also sent my mother over a fruit basket similar to mine and she absolutely loved it. It came at just the right time too, as there was sad news in the household. I was so happy that she had that to brighten up her day. If you don't know about Sharis Berries, they are a gift site that offer a plethora of amazing chocolate covered berries, other foods, wine, giftbaskets and so much more. There is something for anyone and it's hard to pass up all the aesthetic delectable-ness in your face. 20 Bags Stash Premium Orange Spice Black Tea (1.3 oz.) Company replaced with Stash Lemon Ginger. 20 Bags Tazo Awake Tea (1.8 oz.) Company replaced with Lemon Ginger. Moondance Baking Butter Cookies (6 oz.) Company replaced with Cookie brittle. I was so excited to receive this basket and when I did, It was almost perfect. There was one caveat. A small but still significant one. I got a different box of tea and cookies than what was pictured. I was really looking forward to having the Tazo Awake tea pictured on their website. It does say that items may be subject to change so I stress only that I would have been happier if I didn't get doubles. UPDATE: Just call and they will replace what you didn't get! The cookies that were replaced were still really delicious, but I was relieved that the baklava wasn't replaced too, as that was another reason I ordered it! I haven't had baklava in a long time. Theirs was incredibly satisfying. In fact, that baklava was the best I have had in a long time. The fresh fruit was very tasty. It is definitely not your average produce. It tastes much fresher. The dried fruits were also amazing, so chewy and savory. The rice crackers were a nice unique touch and also very good. Lastly, the blueberry jam tasted homemade and went great on my toast. Back to the fruit though, those pears are SO delectable. I mean really, you need to try these. This basket made for a lovely week of breakfast and brunches. The price tag on this is a bit pricey, I know, but you really do get your money's worth. I do think that it would be more satisfactory to add a few more things though. Perhaps more fruits. The quality is truly outstanding and I love that the basket everything comes in is reusable and fits my decor beautifully. That is definitely something you can factor into the pricing, making it look more attractive. 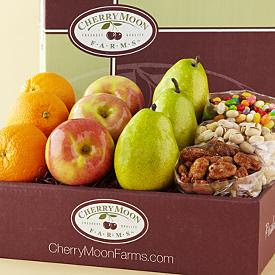 As for my mother's fruit basket, I sent her The Cherry Moon Farms Favorites for $39.99. As I said before, she had some bad news and this couldn't have come at a better time for her. She was ecstatic with the basket and said that everything was divine, but her favorite was the fruit. She could not believe how fresh tasting it was and asked me how she could get another one. Jelly Belly Jelly Beans are also one of her favorite candies. She doesn't eat sweets very often, because she's watching her weight and health, but I knew she wouldn't mind indulging her sweet tooth a little and she deserves it. I think that pricing for this was spot on and worth it, especially because of my mom's sheer delight. I'm glad that everything came that I ordered for her and how perfect and fast the timing was for delivery. Shari's Berries is absolutely one of the best places I have had the pleasure to experience gifting with. I highly recommend you check them out and don't forget the coupons all over google and their own site!